Dickon Ross is the Editor-in-Chief of Engineering & Technology Magazine, published by the IET. He is also the launch Editor of Flipside, a science, engineering and technology magazine aimed at teenagers. Cathleen Shamieh is a technology writer with extensive engineering and consulting experience. Gordon McComb is an electronics author and consultant. Part I: Understanding the Fundamentals of Electronics. Chapter 2: Manipulating Electricity to Make Something Happen. Chapter 3: Meeting Up with Resistance. Chapter 4: Getting a Charge Out of Capacitors. Chapter 5: Curling Up with Coils and Crystals. Chapter 6: The Wide World of Semiconductors. Chapter 7: Cramming Components into Chips. Chapter 8: Rounding Out Your Parts List. Part II: Getting Your Hands Dirty. Chapter 9: Setting Up Shop and Staying Safe. Chapter 10: Sussing out Schematics. Chapter 12: Measuring and Analysing Circuits. Part III: Putting Theory into Practice. Chapter 13: Exploring Some Simple Circuits. Chapter 14: Great Projects You Can Build in 30 Minutes or Less. Chapter 15: Ten Exciting Electronics Extras. 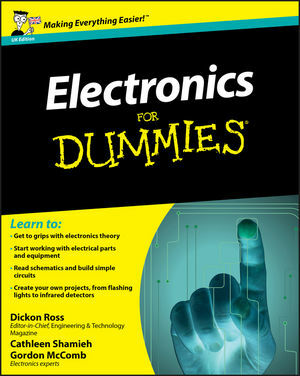 Chapter 16: Ten Great Sources for Electronics Parts.